Imagine this, you are a cobbler in 323 BC, and you cobble away happily because you are good at it. Also imagine that nobody has ever told you how the world works except that you are supposed to make gorgeous shoes, and because you are good at it you start making more even before you are told to. One day a stranger passes by and notices your “surplus” shoes, and before you know it you are being punished (do not try to imagine how), because Shudras are not allowed to possess any form of wealth. That was the Varna system followed by the ancient Indians from which the “modern” caste system takes shape. It was the first known form of reservations, that gave 100% reservation for Brahmins in education, 100% reservation for Kshatriyas in power, 100% reservation for Vaishyas in trade and 100% reservation for Shudras (Bahujans) in service. The Varna system is discussed in the Vedas and the Manusmriti, which was a religious and a legal text in the ancient and the not so ancient Indian empires. These texts detail the Brahmanical/Hindu theory of the origin of the Varna system while the extensive legal acceptance of the Manusmriti is hypothesised to have political reasons. One theory supposes that the establishment of this system started with the Aryan invasion of the Dravidians. The Aryans in order to exercise control and power used the Varna system, which also served as a segregation method. Another theory suggests that hierarchical occupation ensured better-skilled labour resulting in a surplus, which meant a better revenue for the state. Accounting and recording the civilians and their incomes also became a much easier task. Whatever be the origin story of the caste system, it has done more segregation than contributed towards the societal structure. And today more than 2000 years later, politics still remains a motivation for reservations. The first recorded form of reservations that aimed at increasing equality was by Shri Chhatrapati Shahu of the Maratha Kingdom in 1902. Although his philanthropy through his contribution towards affirmative action is not missed by anyone, it is hard to not relate these actions to his political ideology aligning with Phule, Ambedkar and the Swaraj movement that aimed at educational and industrial development at par with the East India Company. The Raj’s encouragement of education of Indians was in order to gain better employees, who would be paid a lot lesser. Post Independence- 4 out of the 6 extension amendments to the Reservation Act have been done close to elections. The NDA’s Jat reservation controversy of 2014 spewed as its announcement came one day prior to the general election. The crux of 1990 and 2006 reservation protests was set against unstable governments. The most recent being Modi’s proposal for introducing a 10% reservation for the economically backward of general category is being called “one of the most spectacular acts of cynical legislation.. since the Emergency”. The Hindu upper caste of this country makes up about 26% of the population, while they make up 66% of the graduates from central institutes of higher learning. The caste composition of 13 IIMs’ faculty (5 SC/STs out of 642) also indicates a major lag where “smart” colleges and jobs are concerned. Amidst all the political gimmicks, controversies and protests, the state’s pathetic efforts at attaining equality have failed. These statistics and many more instances of the daily lives of the historically oppressed urge us to believe that reservations matter. And so we forget this system for what it truly is- a quick fix. In 1950 when reservations were first introduced, they were supposed to last a decade, they were supposed to be the affirmative action for one generation, a policy that worked best with such a system. But, the generational politicians then cast their dice to mould it into a gambit, turning the economic map of this country into a child’s playbook. Reservations are indicative of the economic strength and the class segregation of a nation. The more the reservations, the farther it is from a functioning, economically sound society. The dependency argument cannot be ignored here, caste-based coaching classes to clear CAT and JEE are proof that it has gone too far and too long. Attempts at the removal of creamy layers from backward classes and inclusion of weaker sections from upper classes indicate towards the need to convert the caste-based reservations into class-based reservations. Although this poses another argument- Reservations are a form of affirmative action, to assist the previously oppressed; an economic class based reservation system would pose the problem of drawing a line between the oppressed and the personal failures. Reservations stand right in the face of individual merit, and when it is stretched for too long, the lines between them blur. And going by the current tides, it might happen very soon. The gaps in our education system and its obvious inability to provide a standardised education throughout the nation, irrespective of it is public/private status, its inability to provide for trained and skilled professionals, that the nation today demands and the inefficiency of administration is creating the wedges between the “classes”. 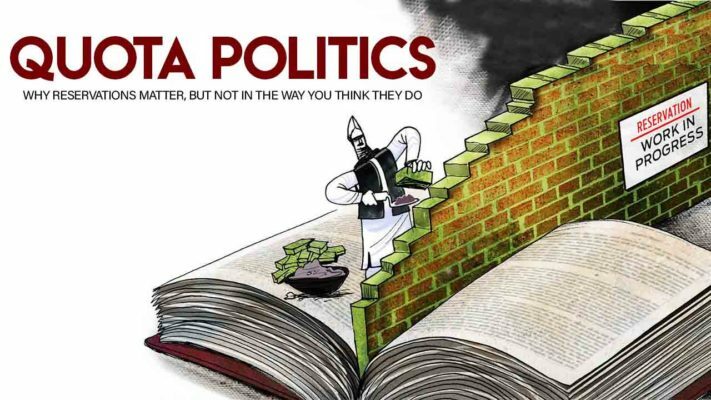 The wedges that today’s politicians (who very wittingly promise 10% reservations to the section that already gains 20-30% of the seats/jobs) are desperately trying to fix, with the duct tape of reservations, its inadequacies, before the petals dry out. For anybody who tries to dig into the reservation debate, the writing is in bold pink that Reservations Matter. Reservations matter because the nation must undo centuries of oppression, they matter because it is not just a welfare method but a political gambit, they matter because it determines how many questions you need to get right to get into a college, they matter because you want some women making laws. What must be read in between these lines is that reservations matter because they must go.